Think I'd agree with you on that one, the PC was basically Betfair's annoyance that people were making plenty of money off them with relatively little efforts. Mainly down to flaws within their system they just couldn't plug as easily as the old tricks like getting in front of the queue when you could bypass Betfair's odds ladder input a hidden 0.0001 on your own odds or the trick of beating the in-play delays that were well known amongst quite a few. I'm sure there are plenty of books in the wings waiting to come out about the 'scams' in those early days and the fortunes won through loopholes rather than skill. But whilst there's still loopholes there and money to be made I doubt we'll see the likes of the legendary racetech guy's books just yet. I'm guessing Brad Hutchins is now too well known on the circuit to earn so a book is pretty much his only option for now. Indeed Brad Hutchins is now retired from court-siding. It appears that since 2011, the year when Danish company Enetpulse were awarded the exclusive worldwide distribution rights for ATP and WTA live scoring data, the tennis authorities are being more assertive in protecting those rights. Enetpulse has reached an agreement with the ATP/WTA/Challenger Tours to become the Exclusive Worldwide Distributor of Tennis Live Data to the Gambling Industry. This means that Enetpulse holds the exclusive data rights by the ATP and WTA to deliver real-time scores directly from the tennis courts via their central scoring system. The ATP and WTA official live scoring is to licensed bookmakers interested in live data opportunities globally. Our official live tennis solution is unrivalled in the market both in terms of speed and coverage. It is the ideal solution for bookmakers looking for the live betting edge on Tennis. Many of the buyers are sports-gambling websites that provide the scores for in-play betting — wagering on the match after play has begun. One site that reportedly buys the scores, Betfair, is a betting exchange that, like a stock exchange, pairs buyers and sellers for transactions when they are willing to agree to the same terms. Except that the buyers and sellers are not agreeing to the same terms, on account of one party having information not yet available to the other. In sports betting, every second counts. As for the "legendary racetech guy", I have no idea who that is or what makes him legendary. I'd like to know more. If he is exploiting a loophole, as the court-siders are, in my opinion Betfair should close that loophole, not tax the beneficiaries in a way that penalises others as well. I'm pretty sure the Betfair founder's didn't envision a world where former employees were pooling resources and flying 'consultants' around the world to take advantage of inadequate countdown delays on their markets. I finished reading "Game Set Cash - Inside The Secret World Of International Tennis Trading" by Brad Hutchins, and I have to say it wasn't too interesting for anyone interested in court-siding. As someone else had said, it was more a series of tales about epic drinking sessions, hot chicks (two activities which really are better experienced first hand than read about), and the ejections by security. All three were repeated a number of times with changes in venues, names and language / approach taken by security, but I suppose something had to pad out 272 pages. To be fair, some of the stories were mildly amusing, and Mr Hutchins isn't a bad writer at all, but what I was interested in was an insight into "the secret world of international tennis trading" which we didn't get. There were some occasional details given, and one of the things that jumped out was the sheer scale of court-siding operations, with sometimes as many as twenty traders present for a match. It was also not clear what the court-sider was technically doing - at times he refers to his activity as transmitting scores and at others as trading. Perhaps not surprisingly, the book doesn't mention the victims who are paying for his drinks, hotels and air fares around the world other than in very vague terms. It does seem that as with High-Frequency Trading, much of the competition is other traders employing the same strategy, but new money is coming from somewhere. One other observation is that this practice has been going on for some time. One tale tells of a guy who made one million euros circa 2006 "sitting on the baseline with laptops" and my guess is that activities like this were the driving force behind Betfair's Premium Charge which was first introduced in September 2008. "While many online gamblers know court-siding exists, most simply don't have the means, imagination or drive to join the party. So, while it's not a completely secret vocations, those of us who do it have been able to operate with a relatively limited amount of competition and exposure. On the whole, the practice remains largely undiscovered by the general public, and we traders do all we can to keep it that way". "The bottom line is if Betfair didn't exist, online sports trading wouldn't exist, and we wouldn't be sat on court crossing our fingers for their server to come back up. I learn there and then that Betfair is our lifeblood and without it our industry would not exist". When the Gambling Commission looked into in-play betting in May 2008, they sought Betfair's input. Click on the link and read the answers provided. It may be just me, but given the data Betfair clearly had at that time, some of the answers appear to be less than forthcoming. I may have other observations from the Game Set Cash book in future posts, and speaking of posts, this one should see the hit count for this blog reach two-thirds of a million. I probably won't be in a fit state to blog tomorrow. England matches give me a free-pass for epic drinking sessions, hot chicks not included though. One-third of a million hits was reached in December 2011 after 3 years and 8 months, so the pace has picked up slowly as we close in on a million. Scott sent me a link to this story about Billy Walters, a name that regular readers of this blog will recognise. He was featured in the book "The Smart Money" by Michael Konik, who changed Walters' name to Rick Matthews, but there was never a serious attempt to conceal his true identity. Since I read that book and wrote my posts on it, I attended a wedding in the same city that Billy Walters has a multi-million dollar home, and made a mutual acquaintance who knows Billy from the golf club where Mickelson also plays. It would be very interesting to sit in on his operation one Sunday during NFL season, and if it happens, I'll be sure to write about it. Incidentally, the insider-trading case against Mickelson was always specious, and should never have been made public. 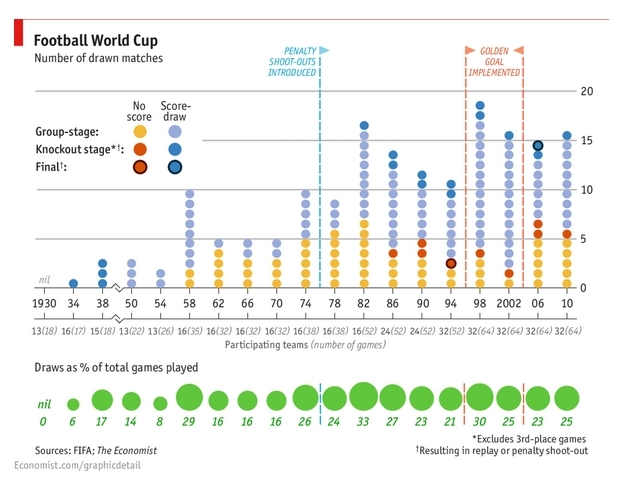 A superb graphic and article from The Economist about the World Cup so far - written before the Brazil v Mexico 0:0 just now completed. Many of you will be familiar with the Birthday Paradox and perhaps seen this article already, but the BBC recently used the 23 player World Cup squads as an excuse to look at it again. Basically the birthday puzzle or paradox is that if we ignore February 29th, a group of 23 people has a greater than 50% chance of containing at least two people who share a birthday (month and day). For the 2014 World Cup players, the four months with the most birthdays are January (71), February (77), March (68) and May (72). These are all above the 61 birthdays a month you'd expect if they were evenly distributed. And the months with the fewest birthdays all come in the second half of the year: August (57), October (46), November (49) and December (51). An interesting read if you like your stats, and who doesn't? By 'bad' I simply meant your reference to the fact that most hedge-funds under-perform the passive investing alternative. I never mentioned the performance of hedge funds. I was talking, quite clearly for once, about managed funds in comparison with index tracking funds. are most often set up as private investment partnerships that are open to a limited number of investors and require a very large initial minimum investment. Investments in hedge funds are illiquid as they often require investors keep their money in the fund for at least one year. As far as better analysis is concerned, what I mean is that some people will be better at analyzing data at the end-of the day than others. True, some financial data will reach big players before others and thus be 'old', but unless those big players are analyzing it perfectly, the fact that they get data in advance isn't going to result in the market automatically 'digesting it'. I think the probability of the big players somehow all missing or misinterpreting some key data is small. It's also not 'some' financial data will reach the big players before others, it is 'almost all' and none is going to reach me first. That is the reality of it. In sporting terms, it's like a tennis layer wins a set with an overhead smash. For the man at home to benefit from that point, it needs not just one court-sider to make a mistake, but for all the others present to make the same mistake (from what I am reading many matches have several court-siders trading the same match). Possible in theory, but really rather unlikely in practice, at least in frequently traded companies / major ATP/WTA events. As for high-frequency trading, that can't really be called analysis in any sense, and while it highly complicates, if not kills, day-trading, I don't understand why someone with a longer time-frame and good analysis skills would be incapable of doing well. A consultant who transmits live scores from the court-side to their back end or a computerised gambling system to take advantage of the time delays experienced by the rest of the online gambling community. a person who provides expert advice professionally. I'm not sure updating scores by pressing buttons fits into this category. Prabhat had a few more comments on my market index post and follow-up, but continues to read too much into my thoughts. I agree that I over-extrapolated from your post, apologies for that. That said, I didn't speak of 'beating the market' either, in fact I don't believe in comparing performances to indexes either. Nonetheless, your approach has a huge embedded assumption that what has been historically true will continue. There's little guarantee of that, and plenty of reason to be suspicious of such reasoning. Sorry for the rant, but I detest this defeatist, mediocre nonsense about financial markets being efficient and 'no one can beat the market, don't even try'. I don't at all contend that most hedge funds are poor, but as a saying goes, '90% of everything is crap'. I am not at all surprised that the average fund is bad, a) because they are average, and rarely will the average anything have an exceptional record and b) because due to the volumes they manage (2% really adds up), they all adopt very similar, risk-averse styles which will make the owners rich even if not the investors to the fund. No one, certainly not me, said that most hedge funds were poor, nor did I say that the average fund is bad. I am still not sure why you are so skeptical that some people analyze things better than others, and that whether it be sports-betting or not, some of the better analysts are not working for big companies. Surely you don't think quality of analysis is solely dependent on quantity of investment in said analysis? I am not even going into the group-think, social dynamics, career considerations etc that ensure that funds don't make optimal decisions. Again, I'm not sure where this comment comes from. Of course some people analyze things better than others. The point I was trying to make, apparently not too clearly, was that when it comes to the financial markets, that 'better analyst' is not going to be me. It could be Prabhat, but I doubt it. The fact is that the data you need for financial analysis is old by the time it reaches most of us. The market has already digested it. Sports analysis offers much more hope. Not only do games take place in front of our eyes, live (or close to live), but the resources an individual is up against are far fewer and more modest, although still formidable. Being consistently profitable from betting is not easy, at least not for me, but it is doable with a combination of knowing your sport, knowing the markets and plenty of patience. I've started reading the "Game Set and Ca$h" book which arrived last week, although there's a football tournament that is taking up much of my free time. I'll probably have a few things to say about it in the next few days, but what is apparent early on is the resources that in-play tennis traders are up against. With the sums of money being taken out of these markets, there are either some deep pockets around or an endless supply of innocents on their way to the slaughter. Funny how the decline in draws I wrote about in the top leagues last season seems to have continued into the World Cup. Just the one so far, which is very unusual in the opening round of group matches, but a result of the high number of goals we've seen - 44 so far, an average per game of 3.14. By comparison, in the four previous World Cups (since 1998) with the same format as this one, the opening group games averaged 2.3 goals per game, and 28.1% of matches ended as draws. If the pattern of previous World Cups continues, the second round will see even more goals, with yet more in the third round before defences tighten for the single-elimination part of the tournament. You clearly believe in the somewhat ludicrous efficient market hypothesis. A couple of reasons to think it's absurd. 1. There's enough statistical evidence that most retail traders consistently lose amounts of money (far exceeding transaction costs), implying obviously, that doing the opposite of what they did would yield a profit. 2. There are many traders who have very long track records of success. I am familiar with the "thousand monkeys hypothesis", but really it's a non-falsifiable claim that anyone who is a winner is lucky. Would you really lay even money on George Soros having a winning year? 3. You say "unless of course they have some kind of an edge, which would be illegal". Only insider information is an illegal edge, and even that doesn't apply to futures and commodities, forex and the like. Superior analysis is an edge that people can have. I could replicate all of your arguments and apply them to sports-betting too, are you just a lucky chump, no matter that you've been a winner over sample sizes greater than 10/20,000 games? If you are so sure markets are efficient, why invest in index funds? That's an implicitly bullish bet as well? How can the market be efficient if it's more likely to go up then down? A couple of clarifications - I never said, clearly or otherwise, that the financial markets were efficient. I don’t believe the word ‘efficient’ appeared anywhere in that post, not even in a quote, so be careful what you assume. The point I was making, or was trying to make, is that Joe Bloggs, sitting at his desk in suburbia, will always know less about the value of a stock than people whose full-time jobs are to trade in that stock. I’m talking about individuals like myself – not hedge funds which pay lobbyists five figure sums each month for tips on upcoming legislation and whose “investments in information” buy them an advantage over many participants. I’m talking about my old friend the chemist, who gave up his job to make a living day-trading, an experiment that didn’t last too long once the market took a tumble. Superior analysis is an edge that people can have – yes, but big players in the markets, not individuals like myself. In my opinion, it’s not defeatist, mediocre nonsense at all – it’s called being a realist. If Prabhat likes to think he has an edge in the financial markets, then good luck to him. I accept that I don’t, that I never will have, and I make the best of it. As an individual, I don’t care about ‘beating the market’. This isn't a zero-sum game. I'm not competing with anyone else, I'm not beholden to shareholders to maximise returns and I’m not a fund manager looking to impress prospective investors - I’m an individual interested in my own money. If my returns are the market average, then I’m beating half the people (or money) in the market anyway, and expecting more than this long-term isn’t realistic for Mr Chump. Why invest in index funds? Historically the best long term investment for keeping ahead of inflation has been stocks. Why index funds rather than managed funds? Because the fact is that most investors are better off investing in index funds than managed funds. § Less than 25% of government bond funds and less than 23% of investment grade bond funds managed to outperform their respective indexes. Now, lest you think that this particular period was an anomaly, let me assure you: It wasn’t. Standard and Poors has been doing this study since 2002, and each of the studies has shown very similar results. On average, actively managed funds have failed in both up markets and down markets. They’ve failed in both domestic markets and international markets. And they’ve failed in both stock markets and bond markets. Sports betting markets have many similarities to the financial markets, but there are also huge differences, not least of which is that liquidity in the former is relatively minute. Also, sports take place before our eyes, and all we should need is our skill in updating probabilities as events unfold, but events impacting stock prices are unlikely to reach my living room before the market finds out about it. Unfortunately these days, as I may have mentioned before, events in sports are being seen before they reach my living room, so the lucky chump may have to settle for average here too. Except that in a zero-sum game, average doesn't cut it of course. 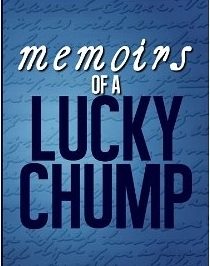 And worst news is that the title for my memoir has been taken! As repeat visitors to this blog will know, I like to keep an eye on the more traditional financial markets as well as the sports markets, and although I long ago realised that I had no edge in stocks, options, futures or commodities markets, stashing money away “every pay day in a few diverse index funds and forget about it” is as solid investment advice as most of us ever need, and I only wish I had heeded that advice in my twenties rather than my thirties. The “forget about it part” isn’t that easy though. Although it’s completely pointless, I am in the habit of checking in on the markets at least daily, on good days perhaps several times. However, as stock prices fall on roughly 50% of days, this means that half the time you are likely to feel bad. The general upward trend of the market means that by checking less frequently, you get bad news less often – about 38% of the time if you check on a monthly basis, and 28% if you check annually. I say it’s a pointless exercise to check daily, but even more than that, it can distract you from making smart long-term decisions. By the time you hear about important news, it’s not news. I do like to look at some of the finance pages though, taking much of the content with a grain of salt. Lots of articles with dramatic headlines, and lots with question marks in them. On a typical day, (yesterday), there were links to articles with the titles “Are Stocks Getting Into Dangerous Territory?”, “How Long Can Stocks Maintain All-Time Highs?”, “Cramer - Prepare For Stock Declines”, and “Is a Stock Market Correction Overdue?” – all very bearish in tone, if lacking any real substance, and then a ray of sunshine with an article titled “These are the most obvious signs the market is heading higher”. Peter Nordsted himself couldn’t do a better job of hedging his bets. The fact is that no one knows. By definition, some managed funds will beat the average one year, and some of those will beat it a second year. Fewer still will beat the average in years three and on, unless of course they have some kind of an edge, which would be illegal, and no one does anything illegal. “No one is really good at predicting the future. Investors tend to get overconfident about the market, but no one is really good at predicting the future—including the experts. We tend to believe more in ourselves than we should," he said. "We all think that we can do better than average and that can be a trap. You gotta play it smart, you gotta lean to the index when you feel you need to and then depend on really smart guys … if they are indeed much smarter." I don’t agree that we do all think we can do better than average when it comes to traditional financial investments. That seems a little unrealistic, and really smart guys tend to be really average guys who had a really luck spell. 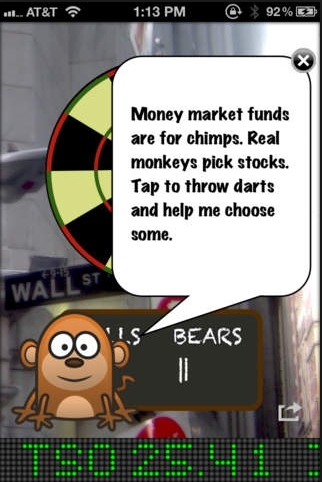 "If you look at stock-picking advice, you find that the experts … are generally about as good as monkey with a dartboard." Now that the final prize money from 2013-14's FTL season has been distributed, (congratulations Skeeve), it's time to look forward to next season, and there appears to me more than enough interest in a second FTL season for 2014-15, so here are some thoughts. The bad news is that I am thinking of raising the entry fee to, a still very reasonable, £52.50 and capping the entries at a maximum of 32. For a bit of fun that keeps you interested for nine months of the year, I think that price is fair enough. In order to justify the hours spent on this to the boss, (and it does take several hours each week), I'm going to use £2.50 as an 'administration fee' with the pot receiving £50. I hope no one objects to this small token fee. With this in mind, I had the rather brilliant idea of allocating a percentage of the pot to a single-elimination competition, i.e. a Cup. Assuming we get more than 16 entries, there will (if necessary) be a Preliminary Round to reduce the number to 16, and then knock-out rounds on specified dates. I'm thinking of using the weekends after the FA Cup rounds take place to guarantee that there is a full schedule of matches for people to choose from. Cup games themselves are not eligible for the FTL due to their absence from Football Data's results. The Cup results would simply be the profit or loss for that weekend's matches and would also count in the FTL - this would just be a side event on maybe five weekends of the season. You could lose 3 points, but advance if your 'opponent' loses 4 points, or you could be up 10 points and be eliminated if your 'opponent' makes 11 points. Otherwise the basic structure will remain the same as last year. I'm also thinking of adding a small prize for each monthly winner, i.e. most profitable entry for the eight months of the season counting August and September as one, and combining April and May also. In summary then, my proposal is that 75% of the pot money will go to the League competition, 15% to the Cup and 10% to the monthly prizes. If we fill up with 32 entries, there will be £1,200 prize money for the league, £240 for the 'Cup' and £160 for the eight monthly prizes. Unless there are objections, the Cup winnings will be 50% for the winner, 25% for the runner-up and 12.5% each for the losing semi-finalists, while the League prize money will be divided among the profitable entries in the ratio of the profits. Thus if four entries are in profit, e.g 6 points, 4 points, 3 points and 2 points, the pot will be split 6/15ths to the winner, 4/15ths to second etc. Slots will be awarded (and are filling up fast) on a first come, first served basis as fees are received - PayPal to calciocassini @ aol.com and if anyone wants to top up the kitty with a sponsorship, and a mention each week, please feel free. Graeme, aka The Football Analyst, has already offered to match his offer of £25 to anyone beating him next season up to a £400 (I think) total liability. Last season cost him £125 but I'm sure the publicity on here made that a worthy investment. Bottom line - it's good fun and an opportunity to show your skill and win some decent prize money. I won't embarrass the author of the screenshot (left) by naming them, but unless there is a late relocation of this World Cup to North America, or a major seismic shift occurs, Mexico will most definitely not be competing on their home continent later this month. I should know - I have, not one, but two, Geography 'O' Levels! At one time, the 'Americas' were treated as one continent, but not for about 70 years in most of the world, and FIFA has six continental federations. Mexico qualified (just*) from the CONCACAF (Confederation of North, Central American and Caribbean Association Football) Federation, while Brazil compete in the South American federation CONMEBOL. For those who like this sort of trivia, there are three South American countries who are actually members in CONCACAF, although one is not a member of FIFA and thus ineligible for the World Cup. Not a lot of people know that. * Had the United states not scored 92' and 93' goals to beat Panama 3:2 in the final qualifying round, Mexico would have been eliminated. (Panama had a player sent off in the 90', so he probably feels quite bad). Mexico may have scraped into a play-off with New Zealand (unbeaten in the 2010 World Cup) but they had no trouble making the finals with 5:1 and 4:2 wins. Anyway, there's a stronger argument to say that Europe is part of the continent of Eurasia than Mexico is in South America, but that would mess up a few World Cup models. The topic of home advantage, and home continent advantage, is covered in a rather (ahem) excellent piece over at Betting Expert. On the topic of the World Cup, I have to give a shout out to Brian at Betting Tools - he has a couple of excellent spreadsheets available for free, one for the World Cup and one for general bet tracking, and both have some nice features. These spreadsheets take a long while to put together, (at least mine do), so it is very generous of Brian to offer them for free. It would be interesting to know what percentage of in-running trading activity on Betfair is court-sider driven, but until the Gambling Commission have the same powers as the Securities and Exchange Commission do in the US, we’re unlikely to find out. The latter commission announced yesterday a set of measures designed to “help the market operate openly, fairly and efficiently to benefit investors and promote capital formation”. This is in response to concerns about high-speed trading that have been to the fore in recent weeks with the publication of Michael Lewis’s “Flash Boys”. In the zero-sum world of sports trading, unfortunately not everyone will be an investor 'promoting their capital formation' (which is fancy a way of saying 'making money' as I think I have seen), but the first part about operating openly, fairly and efficiently is pertinent. One proposal “is a rule that would require high-frequency traders to register with regulators as broker dealers” – in our world, Betfair already know the court-sider driven accounts, and any new ones would be easily identifiable. The problem is that rather than make changes to ensure the markets operate fairly, Betfair have so far chosen to allow the practice to continue while making sure to take a huge cut of the profits themselves. This is a very short-sighted strategy in my opinion, an approach that not only risks intervention from the Gambling Commission (motto: keeping gambling fair and safe for all) as they act to protect the unaware, the unintelligent or the unwise, but also resulting in an inevitable decline in liquidity. I understand that new money will always be coming in to the markets where court-siders are operating, but even the most optimistic of gamblers will at some point realise that the odds are literally against them, and that they are throwing their money away. When you are watching an event and ‘seeing’ what happened on the exchanges long (i.e. more than the delay) before the action unfolds on your TV, why would any sane person get involved? Bet before the game if you identify value, turn the computer off and enjoy the sporting spectacle or go to bed, get some sleep, and check on your capital formation in the morning. As more and more is written about the practice, (and I await the arrival of “Game, Set and Ca$h” with less anticipation than previously, after reading reviews that it is basically crap – a diary of “woke up with a hangover, avoided security, pressed a few buttons, went out and got hammered” and repeat), fewer and fewer people are going to involve themselves with in-running betting, which would be a shame because the founding fathers Bert and Eddie’s original idea of individuals pitting their wits against each other was a great one. What they didn’t intend, hence the n-second delay on new bets, was that the markets would come to be owned by an elite group of individuals benefiting, not from their sharp minds, but from the pressing of a button, or perhaps the twisting of a knob, sewn into someone’s underpants. When you think about it, it's perhaps not surprising that Daniel Dobson was arrested - the surprise being in the nature of the charges that were filed against him. It is of course quite understandable that operatives have taken advantage of the opportunity that the current configuration has allowed, but as I have said before, it is very strange that Betfair have not closed the loophole. 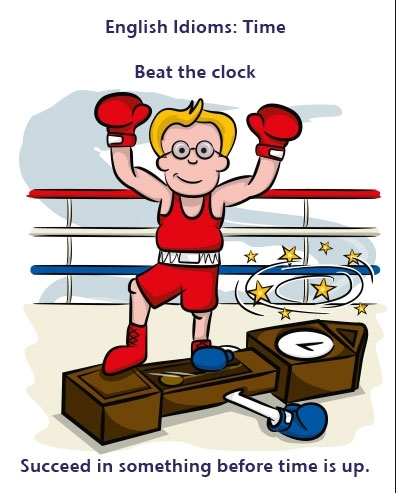 Some of you may recall the ‘beat the clock’ loophole that a real sharp mind came up with a few years ago. What used to happen was that a bet would be entered, the clock would countdown, and then be placed after ensuring (after the delay had elapsed) that the funds were available. At least one enterprising individual took advantage of this design flaw, by tying up most of the funds in his account on an unmatched, and unmatchable, bet – something like Brazil to win the World Cup at 1000-1. I believe his sport of choice was cricket, but the principle is the same whatever it was. He would then enter a bet as the bowler ran up, which he would want to be matched only if a wicket fell. If the wicket didn’t fall, then the bet would be rejected by the system due to “Insufficient Funds”, but on occasions when the wicket did fall, he would immediately cancel his bet on Brazil, freeing up his funds, as his cricket bet hit zero, and that bet would then be matched (effectively) instantaneously. Once that loophole was revealed, Betfair acted fast to perform their ‘credit check’ up front. Why they didn’t leave it open and charge him, and any others using the same strategy, up to 60%, I’m not sure. Perhaps he wasn’t a former employee? While the attention of the word is on proper football, you know, that game where the ball spends most of its time in close contact with the foot, another game called football is in the news to a lesser degree. The tradition of the NFL numbering their Super Bowls with Roman numerals will come to an end after February 2015's Super Bowl XLIX. Actually, it's a one year leave of absence rather than an end, because 2017 will see its return with Super Bowl LI. The NFL has decided that a designation of 'L' 'is not pleasing to the eye'. "When we developed the Super Bowl XL logo, that was the first time we looked at the letter L," [League Vice President Jaime] Weston said. "Up until that point, we had only worked with X's, V's and I's. Well, that's not exactly true - Super Bowl's 40 to 49 all had the L in their designations - and does Super Bowl LI really look any better than Super Bowl L anyway? Anyone saying yes is a LIer. All a bit strange really. As an investor, I can understand a dislike for the L, since it's use is typically to represent a loss, but if you're playing with Roman numerals, it seems to me to be something you should learn to LIV with.